More than 500 Kentucky Farm Bureau members made their way to Nashville for the 99th Annual American Farm Bureau Federation Convention and Trade Show to hear from national agriculture leaders and have a voice in national farm policy, as well as support state competition winners and gain the opportunity to hear from a sitting Commander in Chief. President Donald Trump, who is the first president to visit the AFBF Convention in 26 years, spoke to a capacity crowd as part of the closing General Session touching on a number of issues including rural communications, economic development, regulations, labor and trade. He also praised farmers for their enduring values. At the end of his address, the President signed two executive orders that fund and streamline the expansion of rural broadband. According to information from the White House, the first of these two orders instructs the Department of Interior to dedicate a portion of its assets for rural broadband installation. The second order will streamline the installation process by requiring agencies to use standardized forms and contracts for installing antennas on federal buildings, thus improving process efficiency. In addition to the President, convention attendees heard from USDA Secretary Sonny Perdue, Canadian Agriculture Minister Lawrence MacAulay, keynote speaker and country music superstar Reba McIntyre, and AFBF President Zippy Duvall during general sessions while a host of agriculture experts from government and business held breakout sessions on a variety of topics from NAFTA to the latest livestock outlook for 2018. During the annual business session, voting delegates unanimously re-elected AFBF President Zippy Duvall and also approved policy resolutions related to issues such as trade, regulatory reform, crop insurance, and biotechnology, to name a few. From a state perspective, KFB state competition winners fared well during the convention. Young Farmer & Rancher Achievement Award winners Ben and Katie Furnish of Harrison County finished third nationally, while Discussion Meet winner Miranda Chaplin of Bourbon County made the top 16 in her competition. The Excellence in Agriculture winners Jay and Trisha Campbell of Logan County also represented KFB in an outstanding manner while competing at the convention. Organizationally, KFB took home several honors presented at this year's convention. Each year state Farm Bureaus are presented awards in different categories related to several programs and initiatives. KFB was honored with an array of AFBF Awards of Excellence in all four categories given, including: Advocacy; Engagement and Outreach; Leadership and Business Development; and Membership Value. 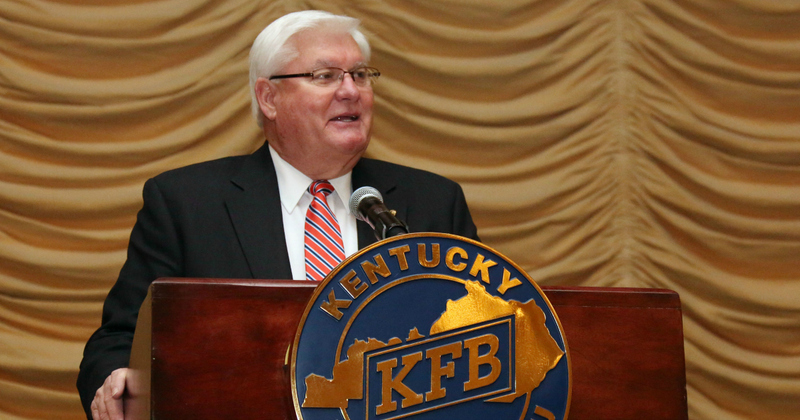 KFB President Mark Haney said he was proud of the efforts made by the organization. "It is my pleasure to accept these awards on behalf of our organization. These awards are earned by the combined efforts of our volunteer leadership and staff," he said. "It takes a true grassroots approach to be the Voice of Kentucky Agriculture at the county, state, and national level. When we are united with one voice, the entire organization becomes stronger and more effective in our effort to advocate on behalf of Kentucky farm families."